I have been working on a few mobile app concepts over the past few months and stumbled across the philosophy of Flat UI Design. I’ve been reading more and more about Flat Design and it’s quite interesting. In the world of web and mobile UI design, flat design focuses on simple shapes, colors and typography to emphasize clarity and usability. It all started by a guy named Allan Grinshtein of LayerVault who wrote a post in 2012 named “The Flat Design Era“. The Flat design style is really just the simplification of interface elements. It’s the Anti-web 2.0 in that it lacks extraneous elements and decoration like the famous web 2.0 bevels, gradients and textures with the goal of creating a clean, simple intuitive stripped down design that focuses on hierarchy. One of the mobile apps I’m working on is targeted at the baby boomer generation that struggle with keeping up on how to use the latest mobile apps that the younger generation are using. Right away, I felt that using a flat UI design is the best way to go for this less that tech-savy target market. I wanted a simple design that is very easy to use and highly intuitive. Flat design seems like the way to go. With Flat UI design being fairly new to me, I’ve been learning a lot about the why, and the how and I thought I would share with you the best resources for Flat Design that I have come across in my research. There are many blogs out there touting the pros and cons of Flat Design. One big indicator of it’s future adoption is that Apple as adopted the Flat Design for IOS 7. The icons on the right show Apple’s flat designed icons. As you can see, the bevels and textures have been significantly cut back. Here are 6 great resources to learn more about Flat Design plus another 10 articles on Flat Design. I love maps. I love how I can explore remote areas of my town and other parts of the world. Google is in the process of revamping it’s Google Maps app for the desktop. There is a new search box and the entire map is now interactive. Clicking anywhere will focus the map on that location and show you helpful things, like related places and the best ways to get there. It now gathers all the imagery of a location into one spot, making it easy to explore your world from every angle and more and more it’s starting to behave like Google Earth, my primary desktop exploring tool. 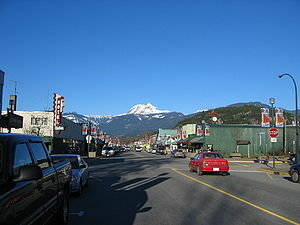 Here is a screenshot of Squamish using the Google Maps. Try it out for yourself. UPDATE: I originally published this post on Nov 2nd 2012 and I thought I would update it with a cool new technology soon to be on the market from Google called Google Glass. This is a tool that will completely change our world yet again and I’m hoping that it will change law enforcement as well. The glasses as seen here on the right can be worn like eye wear to shoot video, get directions, take photos and more. I expect we will see police, fire and paramedics with these devices in the not too distant future. Thousands of complaints and police inquires are done every year about the poor conduct of police officers in the line of duty. Just last week I was hearing comments on the radio of yet another complaint about a police officer assaulting a disabled woman. Luckily in this case, someone was filming the incident which made it very easy to determine the facts of the situation. In today’s high tech world where the cost of video cameras are so low, I think that all police officers that are interfacing with the public should be required to wear video cameras. It’s in the best interest of the public but also the officers wearing them. as well. With camera’s rolling, the actions, behaviors and attitude of the public as well as the officers would be different. People act differently when being filmed and I think this practice would go a long way in helping reshape our criminal system and society as a whole. With video evidence of every incident, it would take less time to sort out the facts and would increase overall accountability. This isn’t a new idea, there are some places that are already doing this. Here are some related articles. Harvard Business review just published a post called “Stop Requiring College Degrees” and I couldn’t agree more with what they are saying. Just because you have an MBA or a degree from a college or university, doesn’t mean you are the best person for a job. In my opinion, experience trumps education every time. If you have a masters degree in project management but have never managed a project with a team larger than 5 people, you will fail compared to a person that has no formal degree but has experience working on 10 projects of various size and complexity and leading a group of people through any endeavor. Age doesn’t matter either but of course, experience does come with age. To me, having academic credential can sometimes provide a false sense of security both to the employer and the person with the credentials. If you’ve only ever studied project management and never really got your hands very dirty, chances are your project will fail. Obviously it’s not just me that thinks this. HBR is talking about and so are many others. The author of the PersonalMBA asks the question; “Is it worth it to get and pay for an MBA?” The answer author Josh Kaufman concludes is that you don’t. He says and I agree that you can learn everything you need without spending $100K+ on school. In today’s world of online education and the proliferation of readily available knowledge. There are better options out there. We redesigned the WYSIWYG Ventures website recently to simplify the navigation and layout as well as get a simplified message to our visitors as to what we do right when they hit the home page. The new desktop version of the home page looks like the image on the left and the mobile version is on the right. It’s a fully responsive web design that works on all browsers and on all devices. We added a portfolio section to showcase the work we’ve done and are still adding more projects to this section. Go check it out and let us know what you think. We’re always interested in hearing feedback on our work.